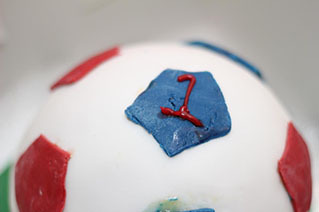 Name of cake: Football Number One! Beat the butter or margarine until soft, add the sugar, then beat until pale-coloured and fluffy. Add the eggs, one at a time, with a tablespoon or two of flour to prevent curdling. Pour the cake mixture into the well-greased Football pans.. When cooked, leave the cake to cool in the bowl for 10 minutes, then, turn it out onto a wire rack to cool completely. 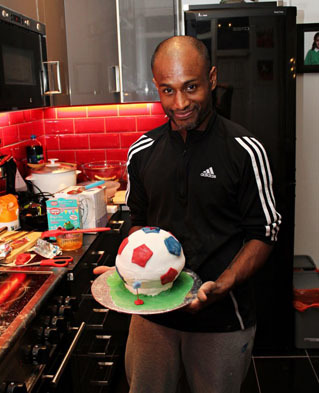 Roll out your white fondant icing and smooth in place over your cake. Roll out the red fondant icing, cut circles of icing and then trim these into hexagonal shapes. Slightly dampen the underneath of one of the hexagonal shapes with apricot jam and place it onto the cake, drawing lines radiating from it to connect to the next hexagonal shape. The three of us really enjoy dedicating our free time to charity work and especially running 5k’s for children’s charity. 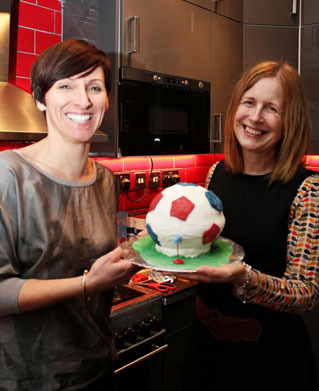 All of us have children of our own and we know just how important having a memory of a special birthday cake can go such a long way to build the confidence of a child. A birthday is more significant than any other day in the calendar, as without this day, any other experiences a child has would not take place. A personalised cake can make a child feel loved, cared for and special. The three of us have never baked as a team before and this was our first time. We got together on a Friday night, instead of going out to party and we had such an entertaining evening, laughing and also enjoying creating a bespoke cake for a one year old child.